For 70 years, the Three Valleys ski region in the French Alps has tempted skiers and snowboarders alike with its impressive facilities and world-class ski conditions. Meribel sits at the heart of the famous Trois Vallees and, with over 600km of pistes, it’s easy to see why guests return year after year to continue their discovery of this inexhaustible ski area. We find that whilst the die-hard regular skiers and snowboarders often have their own ski equipment, most visitors will look for ski hire in Meribel where they can hire all the ski equipment they will need for the duration of their trip. If you’re new to skiing or still consider yourself a beginner, then ski hire is definitely recommended. If you don’t know the type of skis/equipment/clothing you might need, professional ski hire companies can help you find exactly the right kit for you which saves you making an expensive mistake! Whether you need to hire boots, helmets, skis or any other ski equipment in Meribel, a professional ski hire shop will always give helpful advice on current snow conditions and which equipment will best suit your style and ability. Hiring ski equipment in Meribel means that you won’t have to pay the extra luggage charges which airlines stack on top of flight prices for people bringing their own ski equipment with them. Depending on the carrier, ski carriage can sometimes cost up to £150 extra (each way), so renting ski equipment once you arrive here in Meribel is a great option for people looking to save on unnecessary additional flight charges. 3) Don’t Risk an Injury Before You Arrive! Lugging around heavy skis, boot bags and your suitcase (as well as any hand luggage) can put an unnecessary strain on your body before you even hit the slopes. And don’t forget transport to and from the airport (at either end)- taxi firms and airport transfers usually pop a hefty subsidy on the top of anyone bringing their own ski equipment into resort and a bigger taxi often means a bigger fee. When you hire ski equipment the ski hire shop has a duty to keep the kit in the best condition so you’re always going to have the best quality gear. The best ski hire shops in Meribel have brand new ranges every year, and each ski is used for a max number of days before being retired. 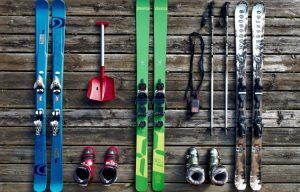 Also, if you choose to hire ski equipment in resort, you can change your skis or snowboard during your trip as required. If you find that your skill level improves or you want to try a different ski designed for different snow conditions, you can do so easily by popping into the ski hire shop in Meribel and speaking to the team. You can even change from skis to snowboard or vice versa if the need takes you! 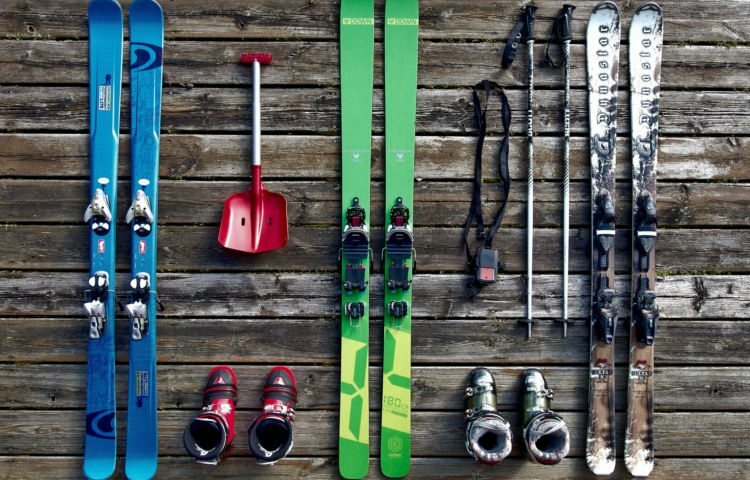 Here at Ski Basics, we strongly advise you to order your ski equipment prior to your holiday. Not only will this maximise your all-important ski time, but it can also secure you substantial discounts of up to 35% and make sure you get the cheapest ski hire in Meribel. By booking your skis online in advance you will be sure to get quality ski equipment that fit your needs so you don’t need to worry about dilly-dallying when you arrive at the ski resort. We know that the comfort of your feet is fundamental to the enjoyment of your holiday – and rental equipment really doesn’t have to be a pain…If you’ve booked your catered chalet in Meribel via Ski Basics already, we are proud to recommend two top quality professional providers of ski hire in Meribel. Freeski Meribel and Freeride Ski & Board Hire each specialise in the hiring the highest quality equipment for exceptional good value. And even better, they give Ski Basics’ customers a substantial discount (when booking online in advance). Staff at Freeski take any hassle out of hiring ski equipment in Meribel and, whatever your level, the friendly English staff will tailor the gear to your exact needs. They stock a huge variety of equipment, from children’s skis, boots and helmets to advanced ski and snowboard gear, with brands such as Scott, K2 and Salomon. Keen skiers and boarders themselves, they will always give helpful advice on current snow conditions and which equipment will best suit your style and ability. The huge store (which also houses a great range of North Face clothing and accessories) is handily located in Meribel centre, however they will happily collect you from your chalet and return you there afterwards. The staff also know that snow conditions change and people like to experiment. Not a problem! You’re welcome to change rental equipment any number of times during your stay. Freeride provides great service and a wide range of quality equipment at competitive prices. Either collect your equipment from their shop conveniently located at La Chaudanne or for a hassle-free service choose their mobile service which will deliver and fit your equipment in the comfort of your chalet at no extra charge. They will even collect your equipment again at the end of your holiday and you can swap equipment at any time during the week. Freeride stocks a wide range of equipment from top ski equipment brands such as Dynastar, Head, Rossignol and Salomon. All ski rental equipment is checked and serviced after every ski rental. To ensure maximum performance skis and boards are serviced overnight using modern tuning robots and boots are disinfected and dried. For your safety Freeride also have a full range of adult and children’s helmets. If you want any further advice about ski hire in Meribel please just contact us or join our vibrant community over on Facebook. We can’t wait to welcome you!